sweet matthew is a boar (pig)…i need to find out what i am! Happy New Year! 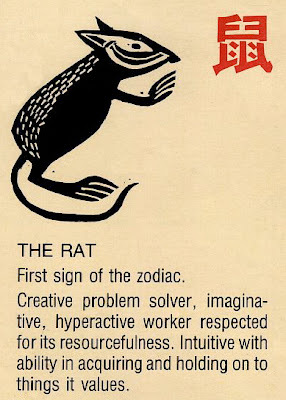 The year of the Rat is going to bring GREAT things for all of us! Happy CNY to you all! Thanks for posting this! It’s amazing how the personalities line up! Thanks Stefanie…I’m a RAT…LOL. Why couldn’t they pick cute animals for the years!!! In my family, I have a sheep, a dog, a pig and an ox — TheMayor is a horse. Of course. Gong Xi Fa Cai, to all of you! I hope you are doing well. I love following your blog & journey to Shepard. I’m a rat with 2 monkeys and married to a rooster. I prefer to think of myself as a large cute mouse though. :o) Is there such a thing?